We’re coming for you 2016! New year’s resolutions have never worked for me — in fact, I don’t know if they’ve ever really worked for anyone. They always sound like a list of rules that I know I will break. I’m not great with structure and schedules so it makes sense a list of rules resolutions would make me feel hemmed in. I need more s p a c e. I want to be inspired not instructed. Choosing a word as a guiding light for the new year works for me because it feels so much more expansive. A word can be embraced as a mantra, a meditation, a reminder, a promise. A word can be interpreted in different ways. A word can’t be “broken” — it feels gentler somehow. In the seven years I’ve been choosing a word for the year, my life has certainly changed for the better. Some of my previous words proved to be wildly empowering — BRAVE, EXPAND and OPEN were all dynamically useful words that helped me create change in my life. Other words have been less helpful: COMPASSION, for example, was a bit of a cop-out in 2011. This year’s word was NOURISH and it’s been the most supportive and nourishing — pun intended — word I’ve chosen so far. I’m excited to see how my word for 2016 tops that! The more I do this practice the more I understand why it’s such a valuable thing to do each year. 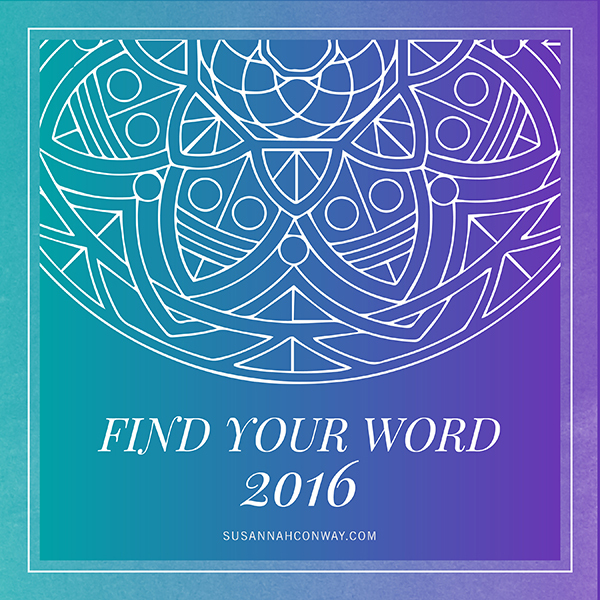 I also know that sometimes we need a hand uncovering our just-right word, so I created Find Your Word to help you find YOUR word for 2016. Oh my how exciting!!! Thank you! I’m so excited! Thanks so much. Last year’s book was so meaningful to me. Thank you!! I love doing these! Aww I was already waiting for this! Looking so forward to it ! Thank you Susannah, for all your lovely inspiring and helpful work. Thank you so much for these incredible gifts!! Blessings for your best 2016 as well!! Thank you!! Thank you very much! Have a wonderful 2016! Much gratitude for creating these beautiful gifts and this space. I am so excited to start this year’s process of unraveling. 2016 is a monumental year for me, I will be working through year 5 of my journey with breast cancer, and in my spirit i feel the need to really honor 2016 and grasp life as never before. Thank you for this wonderful gift. I definitely could use the business version of this! This is my 4th year doing Unravelling. What an incredible and generous gift this is, Susannah. I have enjoyed doing this workbook for a couple of years and look forward to it! It’s such an intentional way to end one year and start another with pause, reflection, and focus. This just made my day! Thank you so much. I have made this part of my year end reflections for several years and it is so great! This year’s word was Thrive – looking forward to seeing what pans out for 2016. Thanks Susannah! Oh my heart is bursting! This is my favourite annual ritual of the entire year. Thank you for continuously providing us with this beautiful practice. This is my 5th year with your workbook! I have a great feeling about 2016. Big love to you Susannah. A dear and supportive FB friend (Karen H, <3!) posted the link; this looks like something i have been looking for, without really knowing! So I have missed several years. Which means that this year I may be ready! Thak you so much, greetings from Sweden. Thanks so much! Wishing you all the very best in 2016. Thanks a lot for being so generous. I really love your Unravelling the Year Ahead workbook. I started in 2013 and have been doing it since. It is an amazing tool to help me “land” right in the new year. With goals, objectives and a clear path of how to achieve it. From the bottom of my heart thanks for being so nice in giving this Christmas gift to us. Hugs and best wishes for a blessed 2016, full of health, love and happiness to you and your love ones. Thank you Susannah ! I’m always so impatient to dive into it ! Thank you so much! I was so looking forward to these for 2016. I am excited to see what the new year will bring, and to deciding upon my word. So grateful for your inspiration. Woohoo! I’ve been longing to dive into the Unravelling workbook … something about this time of year that is bittersweet & slow & melancoly & dark & intense & winter-y. Perfect for inward dives. (although it hasn’t been all that winter-y in my neck of the woods yet.) Now I have to get some new pens. Thank you so much for putting this out into the world! I absolutely loved working through last years Unravelling workbook, so excited to be doing it again. Thank you Susannah! Thank you, Susannah. So happy to see this return. It will be my 5th year of Unravelling. I am thrilled with the addition of the Elemental questions and the Forecasting with tarot or oracle cards, a practice I’ve done for years. Thank you so much for the workbook! I have made this a ritual for the past few years and I absolutely love it. This year ended up being a bit muddled for me so I am hoping to find more clarity and TRUST (my word, I believe!) in 2016. I also recently purchased your book and I am loving it so far – thanks for all that you do and share. I feel a kindred spirit on the pages as I read. I started looking for my mantra for the year last year and it’s allowed me to focus more than ever before. 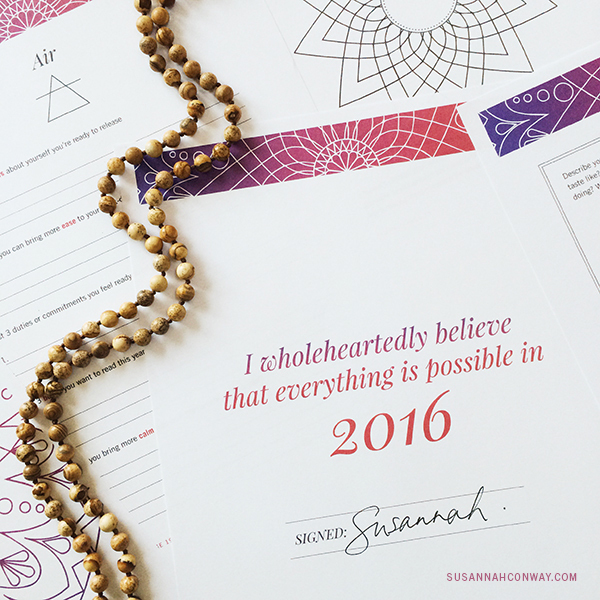 I’m truly excited to find out what 2016 will have for me, to Unravel the threads and see the patterns hidden within. What a beautiful Christmas gift! Would love to access the find your word workbook, have tried repeatedly but no confirmatory e mail received in any mailbox. Feeling sad about this. Oh I am soooo excited. Another year. I have already booked for Find your word. I know I am going to be busy this weekend. I had this feeling recently that I wanted to do something special and meaningful in the next few weeks, something the I was ‘meant’ to do, but I just couldn’t put my finger on what it was. And then your latest post reminded me – Unravelling!!! The anticipation of doing this again, after trying it last year, was very uplifting. So I’m printing it out right now and I can’t wait for tomorrow (a lazy Sunday) where I can spend some quiet time with the workbook and my intentions for the new year. (PS – no errors when downloading the workbook – all good here). Thank you SO much Susannah for the terrific year end and ‘Coming for you’ 2016 workbook! I’ve seen a few offered but yours has so much heart and asks deep questions requiring thoughtful responses that actually are personally revealing (at least for me during the reread). I hope it’s okay that i’ve shared it with a few friends here in the US… they just love it too! How inspiring! I can’t wait to do this! I downloaded last years version of the book but never found the right state of mind to do so. This year I will do it and I am so excited. I already signed up for your email course to find my word. And I have a pretty good idea what it’s gonna be. But I will carry it around a bit more. Thank you for providing us with so much inspiration. Susannah, just wanted to thank you SO much for this. I used the workbook last year and loved it, and was looking forward to doing it again — your generosity is SO appreciated. Also want to thank you for your Word of the Year mini-course. I loathe Facebook and deleted my account months ago, which is fine until such time as I could actually use it :-) I’ll thank you here instead. Last year, I “chose” a word that I wanted to choose rather than letting it choose me [and yes, I took your mini-workshop last year too! I just didn’t pay any attention to it.] The previous year (2014) I’d had STRONG fall into my head all on it’s own and, man, was it appropriate! Rarely a day went by in 2014 that it didn’t help me. But last year I fought intuition [which wanted “Nourish”] to a standstill & ferociously insisted on “believe”, but it never felt right, I forgot about it days into 2015 & for my whole year I kept vaguely trying to pin another word down. 2015 wasn’t a bad year, but it wasn’t as great as I felt it could have been. Thank you, once again, for such a lovely resource. It is invaluable, and I look forward to doing this each year! Happy Holidays. Thank you so much for this, Susannah! I can’t wait to dig in. This really got me ready and focused for 2015 <3 Ready for it to do the same for 2016. Love the look of course and the word ‘nourish’ this really hits the spot. Thank you so much susannah, look forward to journaling with the help and advice in the Workbook. I love re-reading my last years and working on the next years workbook–this will be my fourth one! I tend to work on them in airports; a wonderful transition space. This has become a wonderful tradition and tool. Thank you very much. I came here to find this today and I am excited for it! I love it every year. I actually purposely do not read the previous years workbook until I do the new one, so I can get some perspective without being influenced by things I may feel guilty about last year. Thank you! Having difficulty downloading. Any suggestions? I am very enthusiastic about this. How is it we sometimes need a writing ‘prompt’ to motivate us? Thank you for creating such a lovely platform. Yesterday I turned off my phone and spent the afternoon unraveling the year ahead. It was a wonderful and powerful experience. The words “make it sacred” kept coming to mind while doing the work. What a great way to go into a new year. I am having problems getting the email to confirm my subscription. Anyone else have this issue?